Reports are coming in from California collectors that the second wave of Reveal the Shield deluxes are being spotted at Target stores. The wave consists of Perceptor, Wreck-Gar, ”G2 Laser Rod” Optimus Prime and a redeco of the Classics Bumblebee mold. Our own thedrknss48 found the wave at Fullerton Target, and a member of the Allspark forums reported the same success at Target in Culver City (Jefferson)! Good luck! Thats pretty funny since wave 1 isn't even out in 90% of America yet! lol None in Walmart or TRU either. Wave 1 RtS figures have been seen in TRU stores. Argh ! I'm dead ! I want Perceptor now !!!! I found wave one in places like Kmart and even Kohls. Target is starting to put them out in New York. 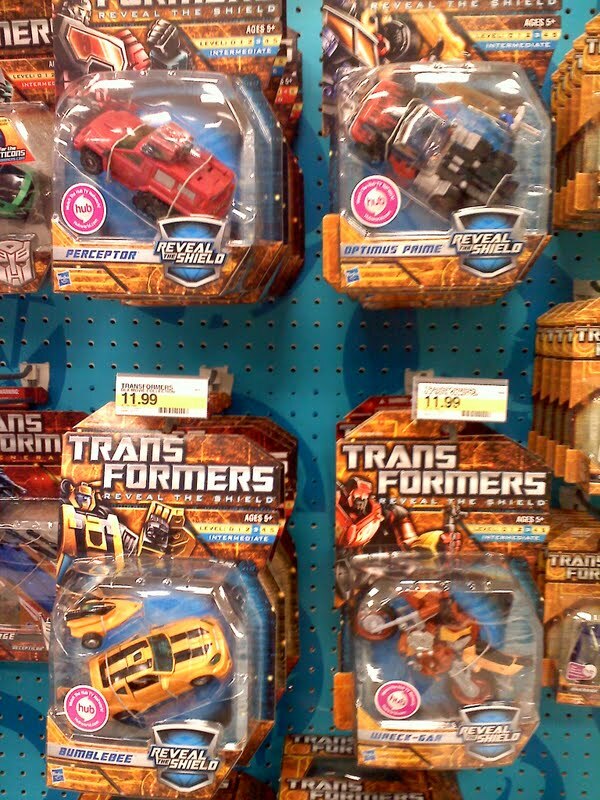 I just saw a tracks and a jazz at target yesterday. Can't wait to get Perceptor and Wreck-Gar! Wreck-Gar is the best of the best. Pure Awesomness!!!! G2OP is under-rated. I like the piping details, very smart on Takara's part. I have the 06' Classics BB, he came with the set so…yeah, I can't wait for more!!!! Got my set of wave 2 today! Now I just need those darn voyagers…. Wow, I must have missed wreck gar, I'm liking him, his transformation looks pretty ingeneious! Still holding out for Grapple! Good to hear if true. I have the money for Optimus & Scourge set aside. Just in case my Stop & Shop gets it first like with wave 1 of RTS. I tend to go to the grocery store once or twice a week to pick up some food. The weather has hampered me from checking Walmart & TRU on a weekly basis. Not that it matters a great deal of their selection has been less then desirable. Does anyone have the DCPI numbers for any of that wave yet? They would make calling around stores hunting a lot easier. Please? They share the same DCPI as HFTD. The DPCI will be the as that from wave one. The DPCI would do you no good if you are looking for these specific figures. I wonder if we might actually get Wave 2 fairly soon in the UK as Wave 1 has been out a couple of Months in The UK… and is now on general sale at more places. At least Wreck Gar is RTS so as much as I despise rubsigns I will at least be able to find these more easily unlike Generations toys (like Blurr & Thrust). I'd believe that, but from experience I know you buy the sets up and sell it to us Californians for 10-15 bucks more. So true. I hope they're so plentiful those crappy scalpers take a loss. Next time I come across some, I'll pick some up for you guys. There is no reason to lie about having items in hand. Pricing is based on supply vs demand. Use e bay and Frank n Sons(you already know that). Those guys charge high but guess what?? Figures sell due to demand. Found a couple of complete sets today. The break down was 2 of each figure for a total if 8. Wreck Gear and Perceptor are the BEST ones from the series. Already? I have yet to see wave 1 anywhere. Shoot, I've barely seen HFTD waves 3&4.